2018 - 2019 Season of Dance! 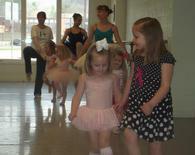 Give your little ballerina a birthday party she is sure to enjoy! Our facilities allow for us to provide a sample ballet class for your child and her friends along with a room large enough for your child’s friends to enjoy cake, ice cream and fun!